I love a good cup of hot drink on these cooler days. It warms my hands, gives me something warm to breathe in and drink... the tea, cocoa or coffee brings me such joy! Sometimes it is one of the few deep breaths I get in a day. I love when my travel cup has this perfect kissed look to it after my first drink. 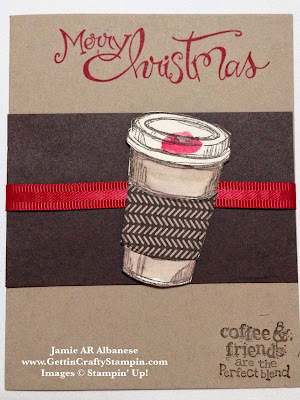 So join me, and many like me, in toasting the season with a cup of love and friendship in a hand-stamped card. I posted on the Gettin' Crafty Stampin' Preview Group this picture and asked the gang what they preferred... a resounding both but the lipstick one was a surprise! Even my hubby guffawed at the lipstick one and said that it was a fun spin on a hand-stamped card. 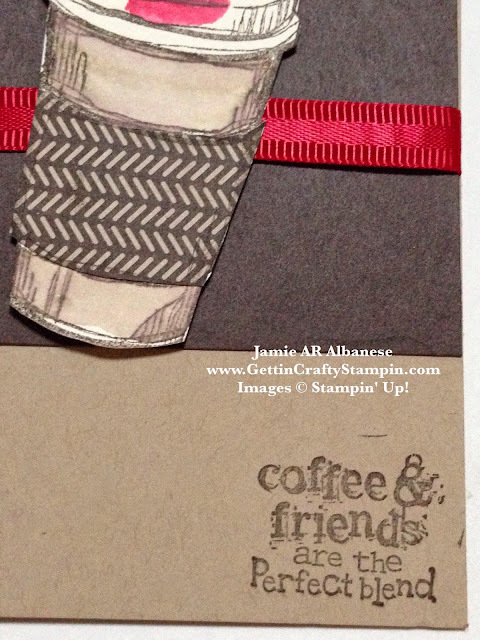 Stamp the Perfect Blend cup on the Very Vanilla card stock in Early Espresso ink. 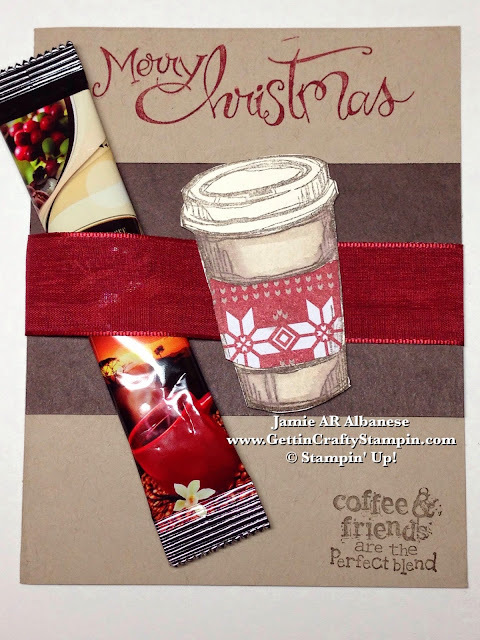 Using the Aqua Painter with water and the Crumb Cake ink pad paint in the cup. Stamp the cup on a piece of the Trim the Tree Designer Series Paper stack and cut out the cozy portion. Adhere it to the watercolored cup for a cool look that pops! Adding the 'lipstick' look is easy, just use the Aqua Painter and a dash of the Real Red ink to create a kissed look. Layer the Real Red Satin Ribbon (what a luxurious feel with this ribbon!) over a strip of Early Espresso card stock. Adhere it to the Crumb Cake card stock base. 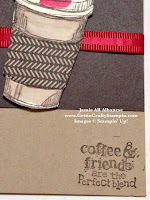 This will allow for a rich coffee feel to this card and the Trim the Tree Designer Series Paper perfectly coordinates! 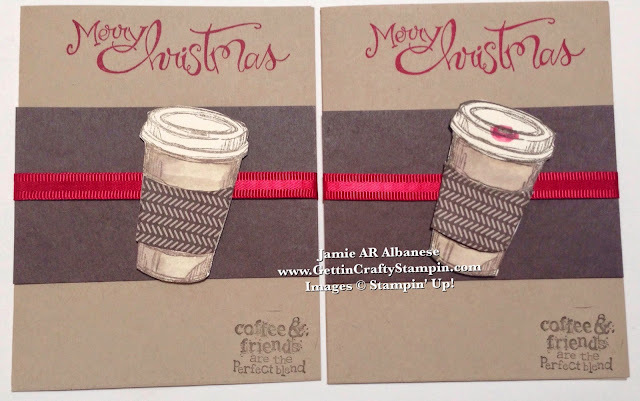 Take it up a notch - my friend and a Gettin' Crafty Stamper, Christine, likes the more traditional look to her Christmas Cards. So on our recent Facebook discussing in the Gettin' Crafty Stampin' Preview group she was the sole person to NOT want the lipstick look to this card - lol. I offered all who voted to receive a free hand-stamped card from me.. I also created this for her as she's that special to me! Changing the look of this paper using the Cherry Cobbler sweater printed looking piece of the Trim the Tree Designer Series Paper Stack and the Cherry Cobbler 1" Sheer Linen Ribbon. Add a coffee stick under the ribbon and you now have a gift in a card! Easy and a sure fire perk up! 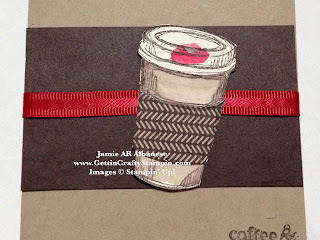 No matter how you go, from a whimsical 'kissed' look to a traditional cup that you'd receive at your local coffee house... have FUN with your card making and paper crafting. Traditional or whimsical, it's great how it can connect with all types of people! Send a hand-stamped card that will warm the hearts of all who see it. Add a gift certificate to a coffee house, a packet of cocoa or tea or a stick of coffee... and it's a gift within a hand-crafted card. May your holiday season be warm and sweet!